The Botany Swarm would like to welcome Josh Smith to the 2019 management team. Josh has been appointed as Botany Swarm Marketing Manager. He developed a keen interest in ice skating and ice hockey after being invited along to the rink by friends a number of years ago to watch a Swarm game – now he’s hooked on the sport! Josh has successfully owned and managed multiple businesses in clothing, clothing manufacturing, events, festivals and consulting. His vast experience in coordinating and facilitating events will be of great value to the team as he works to increase spectator numbers and the experience at The Hive during the upcoming season. 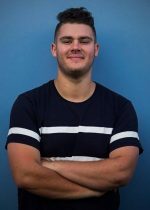 Currently, Josh is the General Manager at DJ4You working alongside nightclubs and festivals throughout the country such as Rhythm & Vines, Northern Bass and Bay Dreams. He has valuable sponsorship and alignment capability with some of the country’s biggest brands and corporate names. Usually, he’ll be found DJing in clubs and at events throughout the country or managing events and festivals until the early hours of the morning. Bringing years of experience in various industries to the Botany Swarm management, Josh will be a great fit for the team. He will ensure all marketing and promotion needs are fully taken care of and will ensure that the Swarm message is out there loud and clear during the 2019 New Zealand Ice Hockey League season. Welcome to the Botany Swarm, Josh!